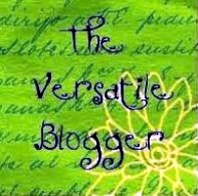 Life Between Pages: The Versatile Blogger Award! I'm back, everyone! It's only been 10 days, but it feels like it's been so much longer! Really happy to be able to get back to blogging. Bear with me while I get things fully up and running again over the weekend - I haven't had any time to finish a book since my hiatus, so that's something I definitely need to do first. 1. Thank and link to the person who nominated me. 2. Share seven random facts about myself. 3. Pass the award on to five blogger friends. 4. Contact and Congratulate the nominated blogs. - I love to keep a regular journal. - My mum is Filipino and my dad is Welsh. I'm English. - In 2007 I was a volunteer at Steve Irwin's Australia Zoo. - My favourite m&m colour is blue. - I constantly wish that there really was an actual DeLorean time machine so I could travel back to 1985. - I'm a huge Peyton Manning fan. - I love to sing but I'm not to great at staying in tune! There you have it! See you soon, everyone.